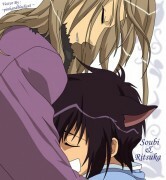 Loveless: Boku no Daijina hito. Minitokyo »	Loveless Indy Art » Loveless: Boku no Daijina hito. This work I did thinking about my sister, the image reminds me of us. I only use a round brush to the color, and the eraser tool.